Drills --- Insight On Coaching Kids --- Practice Plans ...who is behind the baseball positive website? 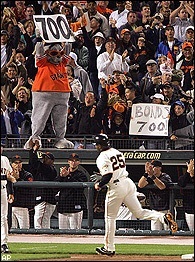 my younger brother todd is in the dugout, just to the left of bonds in the picture. …the Baseball Positive website has been online for years and I’ve never said hello to all the folks who have visited the site. Thanks for stopping by; I trust the content has been useful. Sometimes being young and ignorant has its advantages. When Coach Stephenson came to the lobby of the Shocker offices, the baseball secretary pulled my resume out of their file cabinet. Something tells me it had straight from the envelope into the file and Gene had never seen it. Well, I was there and the 3rd winningest coach in D-I Baseball History took me into his office to talk. While I never made it to the Big Leagues I was fortunate to play football in college as well as baseball. Eastern Washington University offered a football scholarship when I was at Roosevelt HS in Seattle, but turned it down to attend Bellevue Community College and pursue baseball. Assistant Coach Jake Cabell, who was recruiting me, was not happy when I told him I’d decided to accept a $300 scholarship to play junior college baseball over a full-ride to play ‘big time’ college football…my lower-middle-class family wasn’t so sure about the decision either, but was supportive. my boys and i. aaron is a receiver in football. eli is a skateboarder. ...not every coaches kid plays baseball. just support them in what they choose to do. In 2002 the Whitworth University Hall of Fame committee came knocking. Having played two sports no doubt helped; it was an honor to be inducted. But, let's be honest, it’s a classic story of a 'big fish in a little pond', being that Whitworth was a member of the NAIA and had an enrollment of 1,100 (about a two-thirds the size of my High School). That's the Cliff's Notes of the story behind an instructor of kids and their coaches. Yes, there were some cool experiences along the way and while it all has value in what Baseball Positive teaches, the fact is very little of it applies to coaching kids who play on the small diamond. The information shared on the Baseball Positive site, which is dedicated exclusively to the game played by kids ages 5-12, is an effort to achieve one goal: 'Kids have such a good experience that they Want to Play Again Next Year'. Hopefully some of site content is beneficial to you and your kids!